5.3 earthquake hits south of Java. 5.2 earthquake hits the southeast Indian ridge. In the Indian Ocean: Tropical cyclone 05a (Luban), located approximately 136 nm west-southwest of Salalah, Oman, is tracking west-northwestward at 07 knots. South Africa – Saturday’s heavy downpours resulted in cars being swept away and roads being damaged in parts of Tshwane (Pretoria). Low lying areas in Hammanskraal, Ga-Rankuwa and Soshanguve have been severely affected. A heavy hailstorm has also been reported in Vereeniging and Laudium with hail lying more than 30cm thick in places. Sumatra, Indonesia – Torrential rains triggered flash floods and landslides on the Indonesian island of Sumatra, killing at least 27 people, including a dozen children at a school, officials said Saturday. 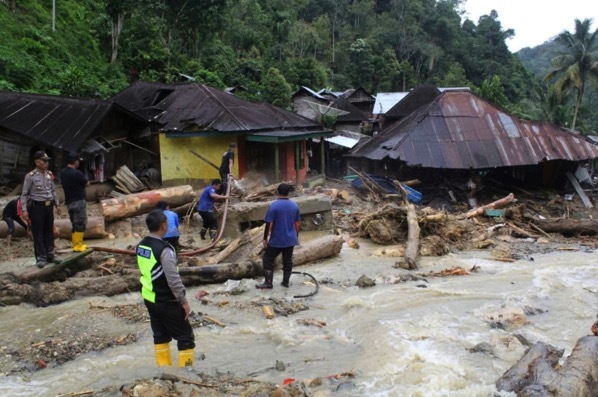 A flash flood with mud and debris from landslides struck Mandailing Natal district in North Sumatra province and smashed an Islamic school in Muara Saladi village, where 29 children were swept away on Friday afternoon. Rescuers retrieved the bodies of 11 children from mud and rubble hours later. Wales – Two people have been killed after storm Callum battered Wales, the western parts of Britain and coastal areas. A Met Office alert warned of danger to life from fast-flowing, deep floodwater and power cuts, and said some communities were threatened with being cut off completely. Tens of thousands of people marched in Paris and other major cities across France on Saturday to call for greater action on climate change. Around 80 demonstrations were scheduled to be held nationwide on Saturday, from the northern city of Lille to Marseille, in the south of France. The protests came a week after after an alarming United Nations report calling for urgent global action to avoid a climate catastrophe. Ukraine health officials reported (computer translated) an additional 554 measles cases (157 adults and 397 children) during the week ending October 6. This brings the total cases to date to 32,489 (13,013 adults and 19,476 children). In addition, 14 people died of complications of the measles: four adults and ten children. Spanish Health authorities confirmed recently the first known documented autochthonous dengue transmission in Spain. Two people living in the Region of Murcia had confirmed cases and third case, who resides in the Community of Madrid is pending confirmation. A second wave of the Ebola virus has been confirmed in eastern Democratic Republic of Congo, where an initial outbreak has already killed 125 people, a minister said Saturday. The latest wave is centred in Beni, a town in North Kivu near the border with Uganda. This second wave occurred as a result of community resistance to measures taken to tackle the disease.